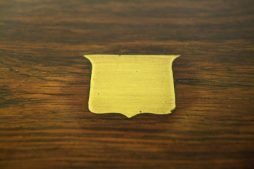 Antique Boxes | Interior Boutiques – Antiques for sale and mid century modern furniture, french furniture, antique lighting, retro furniture and danish furniture. 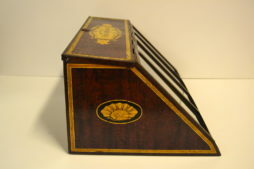 This is an original Anchor cotton box from the 1930s, with concertina action in good working order. 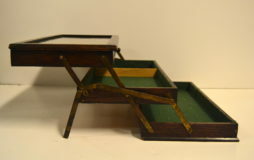 Originally used for sewing thread, but is ideal for selling jewellery, pens, watches, in a truly unique manner. In near perfect condition. This is a stunning decorative Mackintosh chocolate box, dated to the 1930s, which is in great original condition. 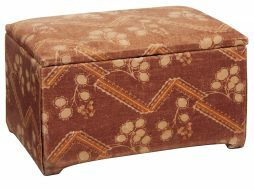 It would be perfect for smalls, jewelry and stationary, particularly in vintage or retail establishments. 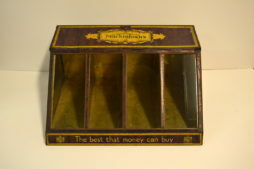 This is a lovely original silko box in great original condition, from the 1920s. We only have one of these available, and the price is including VAT. 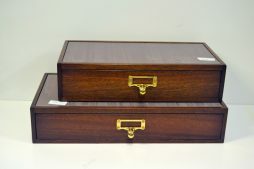 We have these lovely small storage boxes in various sizes at Binder's. They use fetching silver fabric and have a pull out drawer for storage. 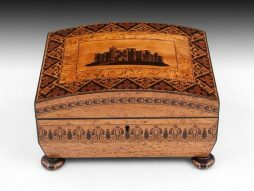 Tunbridge Ware Sewing box veneered in Masur birch with a view of Eridge Castle, with beautiful mosaic borders and turned stickware feet. 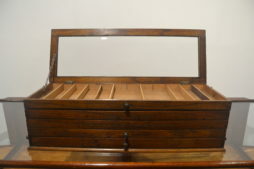 The interior features a main tray which contains six tunbridge ware thread spools, a needle book, tool pad, pincushion, thimble, tape, and several thread winders. This can be removed to reveal further storage space underneath. 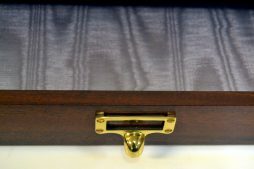 The tunbridge ware sewing box comes with a fully working lock and tasselled key. Coromandel silver Vanity Box retailed by Parkins & Gotto and made by Oliver & Middleton Chapman 1871 This Silver Vanity box is veneered in wonderful exotic Coromandel with brass edging. 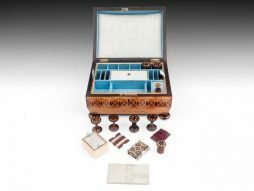 When opened it reveals an assortment of various shaped glass and silver travelling containers as well as a accoutrements pad all housed in dark blue leather & velvet. All the containers are in good condition with no chips or cracks. The four glass jars in the swing out doors are all hobnail cut with the rest of the boxes being plain cut with star cut bases and all of which have beautifully engraved silver lids hallmarked Oliver & Middleton Chapman, London 1871. The front swings open to reveal two concealed push button sprung loaded drawers, one containing ivory brushes and the other for jewellery. The top has a removable travelling mirror and secret letter compartment. 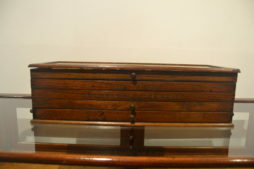 This wonderful box retailed by Parkins & Gotto has a fully working lock and tasselled key. 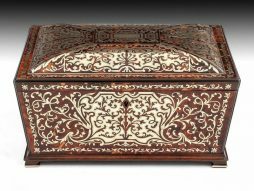 Wonderful boulle Sewing Box with engraved brass and red tortoiseshell standing on four brass bottom feet. The interior is lined with blue paper and has a blue silk ruched backed lid. 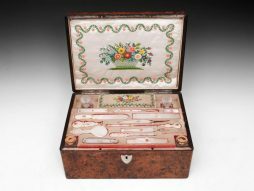 It features a removable tray with several compartments including four superb Ivory thread spools, two thimbles, a perfume bottle, needle books and a tool pad complete with scissors, tweezers and other tools. Underneath this main tray is single storage compartment. 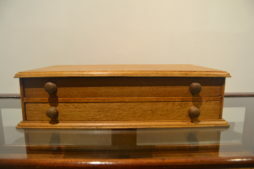 David Edwards of 21 King Street, Bloomsbury Square was Writing Box and Case maker to the Royal family and inventor of the patent military travelling case. 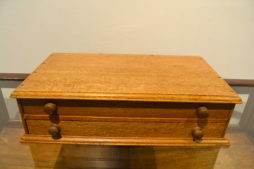 He also made tea chests, jewellery boxes, sewing boxes and canteen cases of the highest quality. He and his brother Thomas were also known to have worked from James Street and Orange Street. 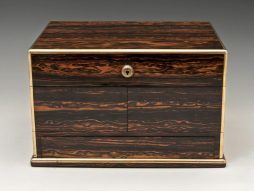 Edwards was known for using the highest quality timbers, intricate inlaid brass, decorative handles and complex mechanisms for secret compartments. He was bought out by Asprey in 1859 and had two royal warrants from King George IV and Queen Victoria. If you are purchasing Tortoiseshell or Ivory pieces and are outside the E.U. you must have a CITES certificate in order to import the item into your country. We can obtain these on your behalf at a cost of £50 and these can take up to 14 working days to arrive at our office. Due to the strict exporting rules of these pieces, they may also come with further shipping costs. 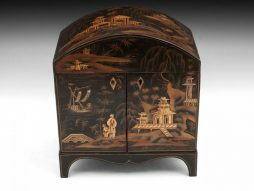 An Early 19th Century japanned sewing cabinet, with chinoiserie decoration on each side in beautiful warm tones against a contrasting black. Unusual arch shaped top standing on shaped bracket feet. 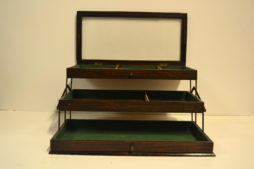 The lid lifts to reveal several compartments for thread spools, pincushion, thimbles and further storage. 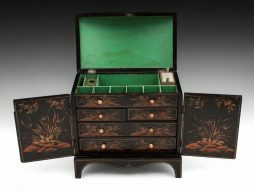 Once the lid is lifted the double doors can be opened to reveal four drawers with bone handles, each beautifully decorated and lined with matching green paper. 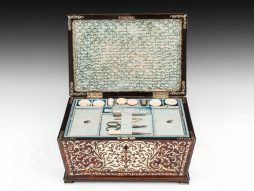 A lovely, outstanding quality fully-fitted mid-19th century French “Palais Royal” combination sewing, writing, vanity and tea box. 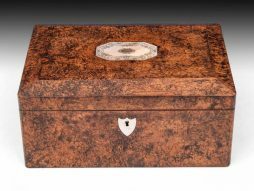 Veneered in rare mulberry wood with canted top and inlaid engraved mother of pearl to the lid, with a shield-shaped escutcheon . The box opens to reveal a full set of original contents, which include some of the rarest, most outstanding quality pieces we have seen. The shell used is very thick and carved to an extremely high standard, with inset rose gold shields. 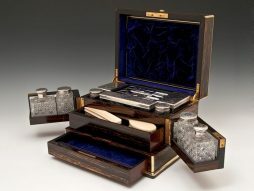 Its contents comprise a stiletto, penknife, bodkin, needle, two rulers, dip pen, pencil, seal, two inkwells, two cut-glass perfume bottles and a superb scalloped caddy spoon in the form of a shell. To the middle back is a never-seen-before raised silk cushioned block, beautifully embroidered with flowers, which lifts to reveal a tin-lined tea compartment. 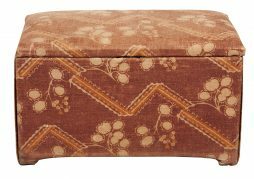 The lid retains its original mirror and removable silk pad for the interior. This beautiful rare Palais Royal box comes with a fully working lock and tasselled key.